I'm preparing to build my 40m version of Roger G3XBM's XBM80-2 QRPP transceiver into a little box but before I start I have one thing more to do. I have to design an output filter for the transmitter. Roger didn't bother. Comments from him suggest that he was aiming for a low parts count and assuming that any filtering would be provided by an external ATU. However Alan VK2ZAY comments that the output was more like a square wave. The second harmonic of my 7.030MHz signal would be on 14.060MHz, also a QRP frequency and I can't be sure that my antenna won't radiate this too. So I think an output filter is a good idea. Alan used a two-stage pi network, each stage consisting of two 820pF capacitors and a 2.2uF inductor. I built this up on my breadboard, terminated the end with a 50 ohm load (actually 47 ohms, the nearest resistor value I had) and checked it with my SWR analyzer. The picture above shows the result. Out of interest I also checked the response of a single stage of filtering using the same values, shown in the next picture. You can see that the cut-off frequency is a lot shallower than when two stages of filtering are used, so clearly attenuation of harmonics would not be as effective. My problem is that I need a filter for 40m not 80m. I tried searching the web to see if I could find some online design tools, and I did here, here and here. However when I fed the design parameters for 80m into the calculators the results they came up with were a lot different from each other and also from the values VK2ZAY used. In the end I decided to use trial and error. I figured that since the frequency is higher the values I would need to use would be lower. The next lower value inductor I had in my parts box was 1uH, so I don't have a lot of choice in the matter. I substituted that for the 2.2uH. The result shown by the SWR analyzer was promising, but there was a big hump below the cut-off frequency and the SWR at 7.030MHz was a bit on the high side. So I then tried lower values of capacitors. The lower I went, the shallower the cut-off but the lower the hump as well. In the end, I settled on 680pF capacitors with the 1uH inductor. There is still quite a steep hump below the cut-off frequency but I'm only concerned with the performance at 7.030MHz where the SWR is 1.2:1, which I don't think is too bad. The cut-off curve of this one stage filter seems as steep as the two-stage one VK2ZAY used on 80m so I think one stage of filtering will do. After I'd written the above, the thought occurred to me to try the low pass filter in the circuit while it was on the breadboard. I'm glad I did, because I'd have been disappointed to find after soldering everything into place that the output power had fallen from 100mW to 25mW. 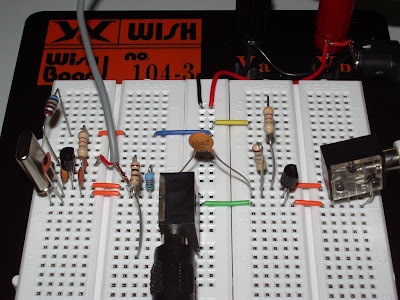 After a bit of experimentation, it appears that connecting the low pass filter directly to the collector of the first transistor as VK2ZAY did in his version of the transceiver loads the circuit and reduces both transmit power and receive sensitivity. The solution seems to be to couple the transistor to the filter using a small value capacitor - I found 180pF gave the best results. This removes the need for the DC blocking capacitor on the output. The power is still down quite a lot, but part of this may be due to all the harmonic energy which is now not making it through to the power meter. My QRP crystals finally arrived. Murphy worked overtime on this eBay purchase: the first batch apparently got lost in the post and the replacements were sent by mistake to another customer with the same surname. But I have at last been able to try out the little QRP CW transceiver built to G3XBM's design on the QRP working frequency. The transceiver is still on the breadboard as I was waiting to try it on both 40m and 80m before deciding which band to make it up for. Certain components need to be optimized for the band in use, and even the crystal in use, since to save space I've hand picked a fixed capacitor to set the transmit frequency instead of using a trimmer. I need also to decide how much power output I want because that is governed by other components. I have had over 200mW out of it but I'm not sure if a 2N3904 without a heat sink could really handle that, so at the moment it is set up to give 100mW output when powered by a 9V rechargeable PP3 battery. I'm leaning towards 40m as this would make a nice little fun portable rig and the antenna being half the size of 80m would make things much easier. 40m generally has more activity during the daytime, too. I have never found 80m an easy band to work with limited antennas and low power, so it has always surprised me that the lower band is so popular with QRPers. Of course, it being the weekend there is a contest on today, so not much chance of being heard with 100mW. Even if someone did hear me and reply, it's doubtful if I could pick them out using a receiver with no selectivity whatever! This tiny, simple transceiver is amazingly sensitive, as you can hear in this 1 minute audio clip recorded on 40m this afternoon using my MFJ magnetic loop for an antenna. How many different stations can you copy? This evening I may put the 80m crystal in and see what it sounds like on that band. Unfortunately the little receiver has no tools for fighting the terrible QRN that comes on during the evening when all the neighbourhood plasma TVs are switched on, and sometimes 80m is all but unusable. 14.100.9 - which does not avoid the long established 24/7 packet network which has already complained about interference by this mode, and is also within the range reserved for beacons. There are a total of three frequencies suggested for 30m, in ignorance of the fact that 30m is supposed to be used only for narrow band modes. Someone responded to my earlier comment that a body like the IARU should decide which modes can work where, by saying that the IARU does not recommend frequencies for specific modes as that would interfere with experimentation. However I still think they should. When left to individual amateurs you simply get a fight between one group of people who don't have a clue and another group, users of existing modes, who have strong views about where they should NOT go. Without some overseeing arbitrator this will just end up as a mode war. I think it is arguable that there just isn't room for a 2.2KHz wide weak signal mode on the HF bands at all. But if true, who is going to make that decision? Late this afternoon I noticed that the ROS website had been updated with a new frequency suggestion for 20m 1 baud operation of 14.105, so I decided to have one more try. For a while I seemed to have the frequency to myself. However I posted that I was calling there on the K3UK digital sked page. Shortly after, WB2YDS posted that he copied my CQ. I didn't copy anything from him, but I called again and the second time I got his report, though not perfect copy as the meter in the ROS program showed he was 30db down in the noise. I sent a report, which I know via the sked page he received, but unfortunately a few seconds after he started KB1PVH started calling CQ and the program started decoding his CQ call instead. With two stations on the frequency it was hopeless, and soon after that Olga called me for dinner and that was that. Normally an almost-QSO wouldn't rate a mention, except that I was using 5W from the FT-817 to a dipole, and WB2YDS was also running 5W to a long wire. I don't think I have ever worked across the Atlantic QRP to QRP before, and indeed I still haven't, but I nearly did, which shows what the ROS 1 baud mode is capable of if you are lucky enough to have a clear frequency for the duration of the contact. Unfortunately the software has a number of issues that need to be addressed before it can be considered suitable for general use, one of which is the ability to lock on to the replies to you and ignore anyone else who comes up on the frequency. Another problem is that ROS is still a mode without a home, and at 2.2KHz wide it needs quite a big home and no-one seems to want to make it welcome. There have already been complaints that by settling on 14.101MHz it is disrupting a long established packet network, and while I'm typing this someone seems to be jamming the 40m frequency 7.053MHz with some sort of digital idle signal. As I said in an earlier post, the issues involved in releasing something like this to the ham populace at large haven't been thought through. Perhaps there needs to be an overseeing body like the IARU that decrees what modes can be used and where, so there can be no arguments. It's a pity that the use of a mode with such promise is being thwarted by so many difficulties, but practical reality often stops you doing what you want to do and ham radio is not immune to this. I got fed up rather quickly with the new digital mode ROS. On 20m it is a zoo, with everyone calling on top of everyone else and very little being worked. I tried it on the advertised frequency on 10m and got nothing, despite the fact that DX is being heard via WSPR on that band. What this proves, I think, is that it isn't enough to be clever enough to come up with a new super duper digital mode. That might be fine if you keep it between you and your fellow experimenters. But if you release it to the masses you need to have a plan for how it will be used given the expected number of users and how you will educate people on how to use it. If you develop a weak signal mode you have to take account of the fact that a lot of people don't have a QRP mentality. They can't see the point in trying to make a contact with low power when they can simply crank the power up. And if they do that, they miss the whole point of the mode and ruin it for everyone else. If a mode cannot be used on a particular band for its intended purpose because of overcrowding or interference perhaps it would be best if it was not used at all. Instead I decided to use my FT-817 lash-up to try the APRS Messenger APRS-over-PSK63 software instead. Whilst doing that I noticed on the waterfall a strange signal almost spot on the 10.149.70 frequency used for APRS over PSK63. It looks like an upside down three pronged fork but comes in two sizes, one wide and one narrow. It starts sounding like a single tone, and then widens to a chord of three distinct tones. But what is it, why is it on that frequency, and are my PSK63 beacons interfering with it? Many people have blogged about their activities over the weekend during the ARRL DX CW contest. I had planned to spend some time making some Stateside contacts, to see how many different states I could work and perhaps make enough contacts to be worth submitting an entry, even though I had no intention to win anything. Alas it was not to be. After just over an hour on Saturday afternoon, during which I had made 17 contacts on 15m, Olga learned that her sister in Ukraine was in intensive care in hospital. It would have been inappropriate to carry on making contacts on the radio, even if I had still felt like it after receiving that news. So that was the end of my participation in the ARRL contest. Olga felt she would have to go urgently to Ukraine to see her sister, which made me depressed and anxious. Kharkov isn't the easiest place to get to from here, even without snow both here and there making the journey more difficult. However on Sunday Olga received some better news about her sister, including the advice that there was little she could do if she went now and it would be better to wait until she was out of hospital before visiting. I'm still depressed at the thought of being without my wife and soulmate for a bit, but at least I will have more time to get used to the idea before it happens. My interest in the contest didn't recover after this, but I did read about a couple of new pieces of digital radio software which I tried out and wrote about yesterday. Both of these programs are very interesting, and I think I shall have more to say about them in the near future. Another new digimode has made its presence on the airwaves. Called ROS, it uses spread spectrum techniques in a bandwidth 2.2kHz wide and offers a choice of two symbol rates, 16 baud and 1 baud. The latter will be of great interest to QRP operators as it is claimed to allow communication at signal levels of 35db below noise, which is better even than WSPR. ROS is an interactive mode, so you can type what you want and have a real QSO, unlike WSPR and the other JT modes that can only send a limited number of fixed messages. What's more it isn't an all-or-nothing mode like the JT modes, so you can receive a message that's part garbage and use your own intelligence to correct the errors if possible. This is yet another program that only recognizes the "default" sound card so I am once again receiving using the HB-1A transceiver and am unable to transmit using the mode. The weak signal capabilities will no doubt make this mode of interest to the QRP fraternity as well as VHF operators working EME and troposcatter. I think the ability to receive an emailed reception report is also rather cool, and a bit more personal than seeing your signal spotted on a website. However I do wonder what will happen once the massed hordes start using it on HF and begin cranking the power up to try to work further afield. There isn't enough space on the HF digital mode bands for many simultaneous contacts to take place using a 2.2kHz wide mode. I'm now listening on 14.101.0 MHz USB so if you try this new program and put your email address in your message you might get a report from me. 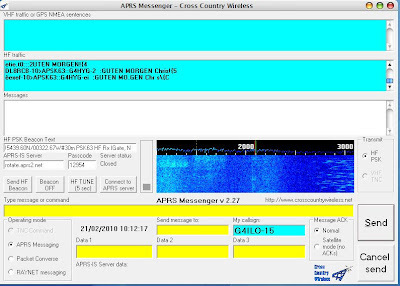 Chris, G4HYG, has just released a new Windows program called APRS Messenger which supports APRS messaging using the PSK63 mode. Various experiments made in the past suggest that this could give better reliability at low power levels than 300 baud packet which is normally used on HF. APRS Messenger also functions as an Internet gateway so any error-free packets received over HF are sent to the APRS-IS network. An unfortunate limitation of the program at the moment is that it will only talk to the "default sound card" which on most Windows computers is the one used to play system noises, listen to Internet audio and video and so on. So I am unable to use it with my K3 at the moment. For test purposes I have connected my HB-1A QRP transceiver to my 30m antenna and fed the headphone output into the mic socket on the front of my PC. I have decoded a few packets already, though many seem to contain some corruption. I am wondering why the little-used QPSK63 mode was not used for this application? As I understand it (and I could be wrong) QPSK63 takes up the same amount of bandwidth but incorporates some forward error correction that improves the likelihood of good copy compared with plain PSK63. Chris has apparently agreed to talk with Lynn, KD4ERJ, about the possibility of making APRS Messenger work with APRSIS32. The possibility of using Lynn's full-featured APRS client to send and receive APRS over HF using PSK is quite exciting. By the way, if you are wondering why the screenshot shows a Mac program the reason is that I'm using an OS X theme under Windows XP! One of the biggest complaints of computer users in the UK is the poor quality of our Internet connections. A major source of consumer complaints is that people aren't getting the promised speeds from their broadband providers. And it's true, though I suspect that the cause of the problems aren't the providers themselves but the common infrastructure they are all forced to use, a legacy of the British disease of under-investment. A couple of months ago I switched over to TalkTalk, subscribing to their Pro package which promised "up to 24Mbit/s downloads." To be fair, they only promised me 14Mbit/s based on my location. At times I am achieving 11.25MBit/s which is not too far short of that and a lot faster than I was getting. The problem is that the performance is not consistent. One evening this week the TalkTalk speed test registered just 0.5Mbit/s, and poor speeds are the norm during the evenings, weekends and school holidays. This is exactly the same problem I had with my previous ISP. The trouble is that more and more people are using computers and the internet but the infrastructure isn't being upgraded to match this. Go for a walk round here in the evening and through a window in just about every house you'll see someone sitting in front of a computer. To make matters worse, people are being encouraged to use the internet to watch video on demand - a huge consumer of bandwidth and a grossly inefficient way of distributing video content in my opinion. Whether it is actually watchable I have no idea, as I have never tried it, but internet radio with its much more modest bandwidth requirement is more or less unusable in the evenings, subject to frequent interruptions while the device fills its buffers. I think Britain is slowly degenerating into a third world country, with third rate inadequate roads, third rate antiquated railways and a third rate telephone network, all the result of inadequate investment by a succession of third rate governments comprised of third rate politicians more interested in feathering their own nests and furthering their own careers instead of doing something for the benefit of the country. This pathetic government has even had the gall to make everyone with a telephone pay a "broadband tax" to pay for a broadband network to be built across the country. Why should this essential improvement be singled out for a special tax while overseas aid, foreign wars and social benefits are paid for out of normal taxation? I would say thank goodness there's an election coming, but from the look of it I don't think the opposition will be any better. Lee W9OY reports on his visit to the Orlando Hamcation in his blog, and he begins with a comment on the Elecraft P3 panadapter for the K3. He isn't nice. He writes: "Elecraft had their little answer to the pan adapter, what a joke. It was a little screen maybe 9 in. and made the radio look like a toy. The quality of the display was horrible." Since I'm a born stirrer, I've tossed a link to this into the Elecraft reflector to see what happens. Unfortunately, Lee is one of those bloggers who is only interested in his own opinion, so his blog doesn't allow comments. A pity, as I imagine he'd receive quite a few once the Elecraft fan club discover his post! I can't comment on the quality of the P3 display as, like most people, I've only seen it in photographs, but I have to say that it doesn't look as nice as pictures of the display built into the Icom rigs. Perhaps it's just because the pictures in the Icom ads were taken by professionals, whereas all we've seen of the P3 so far are photos taken by hams at shows and posted on the web. I do, however, think that Elecraft seriously slipped up by not providing an output for I/Q signals from the P3. This could be fed into a computer sound card and used to run software like CW Skimmer. As regular readers know, I'm not a fan of CW Skimmer myself, but it's apparently something a lot of people who have been using alternative panadapter solutions like LP-Pan or SDR-IQ use. If they wish to continue to use Skimmer there is little point in getting a P3. It looks like a major opportunity lost. According to a posting by Eric, the I/Q signals are only present inside the chip the P3 uses, so it isn't something they can easily bring out for external use. Most of the remainder of W9OY's posting I referred to above is devoted to a description of how he set up a portable system using a Flex Radio and a laptop. It begins with "the .Net frameworks had to be installed" and goes on with installing drivers, optimizing buffers, recalibrating the receiver and installing Virtual Audio Cable and Virtual Serial Port. Fine if you like that sort of thing. But if, like me, you are one of those people where anything to do with computers takes twice as long as you thought and leaves you with half the hair you started with, there are reasons for preferring the Elecraft approach. I have been awaiting the arrival of the postman for the last week with eager anticipation and growing frustration. I have been expecting a set of QRP CW frequency crystals that I ordered on eBay almost a fortnight ago in order to try to make a contact using my little XBM80-2 transceiver. The only 40m crystals I have are for 7.040 which were fine for testing the radio but that frequency is in the middle of the 40m data segment so I can't go on the air using it. I don't have any 80m crystals at all, and I want to try the circuit on that band - which Roger designed it for - before coming to a decision as to which band to build it for. I ordered the crystals from an eBay trader named spratreader because he offers a set of 5 crystals for £6.95 post paid whereas just two crystals plus postage from the G-QRP club would cost £4.60 - and I'd have the hassle of going to the post office to get stamps because they won't accept PayPal for anything less than a fiver. I've had crystals from spratreader before and they came quite promptly, so I'm not blaming him for the problem. Unfortunately I didn't order 80m crystals in the previous set, nor did I realise that the 40m crystals were not for the European QRP CW frequency - perhaps they'll come in handy one day for a WSPR beacon. My order was delayed because spratreader was on holiday. He informed me last Thursday that they had been sent, so I began staking out the postman. After a week nothing had arrived, so I sent an email right after the post came this morning to say that I still hadn't got them. I'd hoped that replacements might be sent today, but I'm still waiting for a reply to my email. So it's looking less and less likely that I'll be able to test the XBM-80 this weekend. It's really frustrating, though with the ARRL DX CW contest on this weekend probably isn't a good time to try making a contact with 100mW anyway. A site called Please Rob Me has been created by some website developers in Holland. 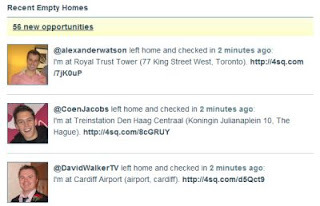 It claims to provide a list of empty homes based on what people post online. The information is extracted from Twitter feeds when people post their whereabouts. Apparently it's been done to highlight the risks of location-sharing through social networks. That sounds a bit like the justification used by sites that expose software security flaws - and we all know where that has led to. Whatever, the site's existence does have some implications for we radio amateurs. 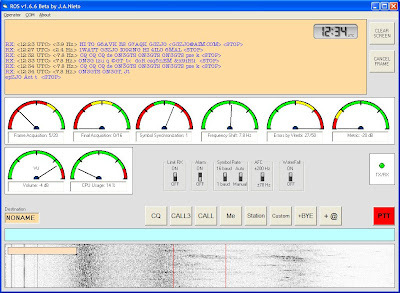 As radio hams our addresses are known via callbooks and sites such as QRZ.com. So we need to be careful about revealing when we are going to be away from home in our blogs and mailing list postings. It is sometimes hard to resist posting about the preparations you are making to take a radio on holiday. And if you take a netbook on holiday it is clearly unwise to post blog updates while you are there, frustrating though that may be. But even if you are careful yourself, it is hard to stop other people from inadvertently revealing online that you are away from home. Someone might post that they worked you while you were on holiday, for example. And if you're involved in a DXpedition or giving a talk at some ham radio event then the clues are there for someone to work out when you won't be at home. The increasing popularity of APRS to show your whereabouts reveals not only when you are away from home but how long it would take you to get back there, much more effectively than any Twitter feed. I would like to point out to any burglars reading that I am married, so just because my APRS position shows I am out of the house does not mean that no-one is at home. Most ham radio activities tend to involve just one member of the family, so it's wrong to assume that just because a licensed amateur is away, his home QTH is empty. I guess that goes for Twitter feeds too, unless it's really true that the only people who use Twitter are geeks who live alone. Perhaps I should be more careful about turning APRS on, and use it only when I am off on some hike with a radio into the mountains, on my own. It's difficult to resist the lure of a bright, sunny day calling you to the hills. It was cold, but not windy - ideal weather for walking. I decided to climb Graystones, a not very often visited Wainwright peak, LDW-187 in the Wainwrights On The Air list. This modest hill should have been an easy walk, but I took a wrong turn in the network of forest roads and ended up having to climb a couple of hundred feet at a 45 degree incline to reach the top. That got the pulse rate going I can tell you. Who says ham radio isn't a healthy sport? I took the unusual step for me of announcing my intention on the WOTA web site, but I guess everyone was busy or at work and for a time it looked as if this was going to be a null activation. Then I was heard by George G6AGZ/M heading west on the A66, to great relief. George expressed his opinion that I must be raving mad to be out on the hills in this weather. I told him it's sunny, the sky is blue, it's crisp but not cold and I have just eaten a packed lunch whilst admiring a glorious view. Who's crazy? 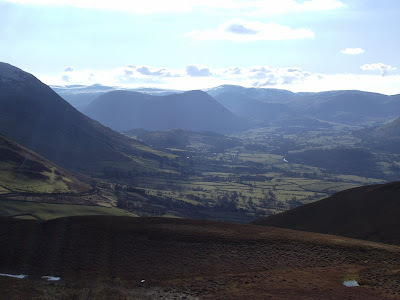 I was disappointed not to work anyone who was actively collecting Wainwright summits. I put calls through several repeaters and repeatedly called on the FM calling frequency. When I say VHF is dead in this part of the world I mean dead. I was literally pushing the off button on the TH-F7E to turn it off before packing up when I heard a signal. I switched on again and it was Colin, M6XSD. We had a contact and he earned his point for working this rarely activated hill. Job done, and a nice walk into the bargain. A number of times on blogs and email list postings I have seen comments that went something like this. "I saw [rare DX] spotted on the cluster. A click and PowerSDR had changed to that band, selected the antenna, tuned the amp and turned the beam in that direction. CW Skimmer showed me the DX station and where people were calling. I saw someone sending a report so I knew where the DX was listening. Another click and I was netted on to him. I sent my call as soon as he had finished and the DX came right back with my report. It doesn't get much better than this!" But does it? Does a freshwater fisherman yearn for a radar that will show him where all the fish are and a net he can stretch across the river so he can pick out the biggest specimens? Doesn't all this computer technology just remove all the elements of chance and skill that provide the interest in radio DXing? Wouldn't it be even better than this if a program called CW Operator actually finished the job by doing the boring part: replying to the DX station, logging the contact and printing out the QSL card? Someone wrote to me yesterday that they had heard of people who had got rid of all their commercial gear and just used an MFJ Cub or similar as their main station. When I see where technology is taking the hobby I'm tempted to follow them. It's the difficulty of making a contact and the thrill of finally achieving it that makes this pastime worthwhile, not the rarity of the station contacted. Do the people who have spent tens of thousands setting up automated high powered stations really get any satisfaction from using them? What's their thrills per buck ratio? One thing is for sure, the folks who got DXCC in the days before computers really earned their awards. I don't think the same can be said for many of today's radio amateurs. A couple of weeks ago I evaluated some programs to help design circuit layouts on stripboard or Veroboard and I wasn't particularly impressed by any of them. Quite apart from any other problems or limitations the programs had, they all suffered from the fact that layouts had to use components that were included in the program's library. If you wanted to use something that wasn't there - and most ham projects use things like trimmer capacitors and coils - adding it ranged from difficult to impossible. I briefly attempted to design a layout using pencil and paper on a Veroboard template that I printed out. But that got frustrating when I needed to reposition components. It soon got illegible with all the erasing and when I started resorting to scissors and paste to move things around I felt there had to be a better way. So I thought I would try designing the layout using a paint program. I created a bitmap image of the Veroboard and another image containing some component layouts. I used an ancient copy of Paint Shop Pro for the task, but you could use pretty much anything. To add a component to the board I just select it with the mouse, copy, then switch to the Vero image, paste and drag it into position. If I want to remove a component or move a block of them I can just select and then cut or drag. I can fill in any gaps I created by pasting in sections of blank board, and touch up the layout with the pen tool. It might sound complicated but it's easier than using pencil and paper and the knowledge that mistakes can easily be corrected means you work faster because you aren't afraid of committing to paper something that will be hard to remove. Drawing the components is fairly easy. They don't have to look lifelike but I got diverted into trying to use photo images to add a bit of realism to the layout. Finding views of components from directly above isn't easy. I found it quicker to photograph them myself than try to find them on the net using Google. Once you have got the image in the paint program you cut away everything except the component body and then shrink it to the correct scale to match the Veroboard template. I mark the connection points with little crosses to help show how it all links up. With this method it's easy to have resistors and diodes mounted vertically to save space, which some of the programs I tried wouldn't let me do. Wanting to use a component that isn't in the library is no longer an obstacle, you can just draw it or add a photo. The only disadvantage is that the computer can't validate that your layout is correct. But few of the software programs could do that anyway. If anyone is interested in this method I could make available the Veroboard and component images I created - on condition that you share with me and other users any new component outlines you add. I have been thinking quite a lot recently about the various digital modes from the point of view of which ones are worth supporting in a program. My own software KComm developed for the Elecraft K2 and K3 supports only PSK natively, mainly due to the existence of AE4JY's PSK Core DLL which makes it easy to add PSK31/63/125 support to any Windows program. I can always use Fldigi or another program if I want to use other modes. But you get used to using a particular program and there is a certain challenge in adding support for other modes, which is why I have been spending time wondering whether it would be worthwhile to do so. The more I think about it the more I tend to the conclusion that PSK31 is the only digital mode that is really worth bothering with. Its usage greatly exceeds everything else including, I suspect, RTTY. It has achieved 'critical mass' which means there are always new stations to work including exotic DX locations. This single point outweighs any of its disadvantages, such as the fact that the phase shift information gets messed up by disturbed paths, it's harder to set up to give a clean signal or that some MFSK modes such as Olivia that have redundancy and error correction are more reliable with weak signals. PSK31 is a narrow band mode and the benefit of that is often overlooked. I think things would be getting pretty ugly in the digital mode band segments right now if all the people who currently use PSK31 were instead trying to use much wider modes like RTTY, MFSK or Olivia. RTTY. RTTY was the first digital mode I ever used, way back in the days before sound cards, so I have nothing personally against it. I suspect it is the second most popular digital mode after PSK31. I don't think RTTY use has died off, so much as it simply hasn't enjoyed the growth in popularity that PSK31 has. RTTY would be my main candidate for the next digital mode to support in my program. Except that in the last decade or so I have hardly ever felt any inclination to use it. One reason is that RTTY is a grossly inefficient mode. It occupies a lot of bandwidth for its data rate, due to the fact that it was designed long before computers and DSP were invented and had to be decoded using an analog frequency discriminator. It has a limited character set geared to the Teletype devices it was meant to be used with, and requires a shift character to go between letters and numerals which adds to the likelihood of receiving gibberish if this character is not received whenever it is sent. Consequently RTTY users adopt the sledgehammer approach and run very high power to maximize their chances of good copy. RTTY really is an outmoded mode that has absolutely no advantages or benefits and instead of encouraging its continued use perhaps we should be persuading people to change to more modern alternatives. MFSK. MFSK was developed by ZL1BPU and IZ8BLY in the early 2000's and I was an enthusiastic user and advocate of it for quite some time. MFSK16 seemed to give more reliable copy than PSK31 at the same power level. It also had a nice feature for exchanging small bitmap images, similar to SSTV. However in recent years it seems to have fallen out of favour and these days you rarely hear it. Other multi-FSK modes have also come and (in most cases) gone, such as DominoEX, MT63 and Olivia. The benefits of all these different variations on MFSK escapes me, though I'm sure at least some of them do have benefits, however they have never caught on and would probably die out altogether if they did not live on as options in the menus of programs like HRD, Fldigi and MixW providing temptation for every new convert to digimodes to try them. All these modes seem to achieve is confusion and a proliferation of "What's this mode?" threads on QRZ.com. There just aren't enough users to make many contacts with them, and anyone calling CQ using one of these modes is heading for disappointment unless they happen to be spotted by a PSK31 user who manages to guess what mode it is and takes pity on the poor caller. These modes should really be consigned to the bit bucket of history. JT65A. A mode currently enjoying a surge of popularity on HF is JT65A, thanks in part to the easy to use JT65-HF software written by W6CQZ. I tried this myself recently and made a couple of contacts before starting to wonder what was the point of it? As Wikipedia explains it, JT65A was developed to allow contacts to be made over slowly varying paths where signals are expected to be weak, such as EME or long distance troposcatter contacts on VHF. Such contacts are likely to be prearranged skeds over paths where no other mode except high power CW is likely to make it. However the use of this mode to make random contacts on HF seems pointless. People frequently seem to be making contacts when signals are strong enough that the contact could be completed more quickly, with the exchange of a lot more information, using PSK31 or one of the other digimodes. Signals on HF tend to vary quite a bit, so that even if they are very weak some of the time there are periods when they are strong enough to support "regular" modes. Do the problems that JT65A was designed to overcome actually occur on HF? I don't think so. Conclusion. The conclusion I came to after the ponderings I have tried to summarize above is that PSK31 is really the only digital mode worth supporting if the aim is to make the maximum number of contacts. RTTY would be worth supporting for legacy reasons because it is still quite popular, although nowadays it seems to be little used outside of contests. From a technical perspective RTTY is arguably a mode that ought to be phased out. The other modes I listed - and some that I haven't - are so esoteric that that they are not worth bothering with because there isn't a critical mass of users to ensure a good number of contacts. These modes may be interesting to try out, but as such they ought to remain within the realm of their own specialized programs - much like the original IZ8BLY Stream MFSK software of a decade ago - so that users are forced to make a conscious decision to use these modes and hopefully find out a bit about the purpose behind them, instead of just picking them from a menu because they are there. No doubt there will be many who read this far (if anyone reads this far!) who will disagree with my conclusions. But from now on I expect to stick exclusively to the PSK modes on the HF bands and stop worrying about the other twiddly noises I occasionally hear on the airwaves. Valentines Day today, so not a day for spending too much time on the radio. Hence, I've joined the WSPRers on 17m for the day. Nothing much happened overnight, but I spotted 5N7BRJ (Nigeria) at 0814, together with a whole sequence of spots of VK2WD over half an hour - both stations running 5W. My 2W signal is being spotted consistently by 5N7BRJ. Looks like being another day of good propagation. It also looks as if after 0800 might be a good time to try to contact Australia. 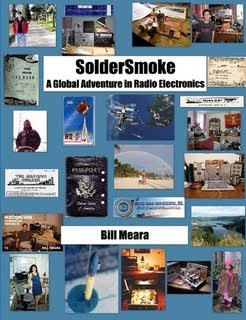 At the start of the week I ordered a copy of fellow blogger Bill Meara I0/N2CQR's book SolderSmoke - A Global Adventure in Radio Electronics as a consequence of reading several positive reviews. It is entirely typical of my experience of purchasing anything that it arrived today, the day Bill announced in his blog that the publisher is offering 15% off the price of the book if you order it this weekend. I haven't had a chance to look at it yet so I can't give you any encouragement to buy it other than the chance of getting it for 15% less than I did, but that's probably a good enough reason! I had hoped to make some solder smoke of my own this weekend, building up a permanent version of Roger G3XBM's amazing little two transistor transceiver the XBM80-2. However my 3.560 crystal still hasn't arrived. Instead I contented myself with trying a few mods with the circuit still on the breadboard. Following good results using a pair of 2N3904 transistors in Darlington configuration for the audio stage, I tried an MPSA13, which is a pair of transistors in Darlington configuration in a single TO-92 case. This provides a worthwhile increase in gain. In fact, as I'm using a crystal for the American 40m QRP frequency (which is in the digital modes sector over here) I am actually being deafened by the sound of loud RTTY stations in the crystal earpiece. With the MPSA13 the receiver gain doesn't seem to fall off when using a 9V supply instead of 12V, which is good as such a tiny transceiver should really be run from a tiny power source like a PP3 battery. Alan also adds some filtering to keep RF out of the audio amplifier stage, and a two-stage low-pass filter to tame some of the harmonics on transmit. I added the filtering, which made the receiver sound a bit cleaner, but I can't try the 80m low-pass filter until I have the rig on 80m. The oscillator circuit of the XBM80 will oscillate just about anything, so I used it to find out the operating frequencies of the 2m FM transmit and receive crystals I bought on eBay. All of the receive crystals operate around 14.9MHz, even three of the ones that weren't marked as receive crystals. That explains why I spent a couple of hours failing to find their frequency of oscillation at all, as I was hunting around sub-multiples of 145.500. Grrr! Out of the batch of 15 crystals I have two for 145.500 and three for 145.550, all but one of which are probably 36MHz third overtone crystals as they oscillate around 12.1MHz at a frequency a bit below the two metre frequency divided by 12. The other 145.550 crystal oscillates around 8.08MHz. The plan is to make an FM version of Roger G3XBM's Fredbox. So I need to look for a way to frequency modulate the oscillator in Roger's circuit. Suggestions, as always, are welcome. Lynn, KJ4ERJ, has just released new versions of his APRS client for Windows PCs and Windows Mobile. Among a whole host of improvements the client can now communicate with RF via TNCs. It also supports read-only use of AGW Packet Engine. Information about the software and downloads can be found at the APRSISCE Yahoo Group. Lynn has also created a Wiki for information about APRSISCE. I set it up the Windows version APRSIS32 with AGWPE in sound card TNC mode connected to my Elecraft K3 tuned to 30m. The screenshot shows the position reports and beacons received. Actually this does not represent the stations received, as some of the icons are for stations that were digipeated by HF gateways on 30m. I did this more for curiosity's sake and to help test Lynn's program, as I personally don't have any interest in operating APRS on HF, whilst the lack of VHF APRS coverage in this area makes the cellular data network a more effective means of using it for me. I am interested in investigating the possibility of using APRS on VHF as a means of detecting Sporadic-E openings on 2m. But for that I will be more interested in the location of the station that transmitted the packet I heard rather than the location of the station that originated it. What a difference a few sunspots make! Today the 15m band was open bringing lots of signals on PSK31, though I was tinkering with KComm and wasn't devoted to making contacts. Just before lunch I briefly heard A71CV (Qatar) and tried to call FM5AA (Martinique) who was running a pileup 0.1 to 0.5KHz up. Patience is not one of my virtues and I eventually gave up. It is not the first time I have heard FM5AA and I'm sure one day I'll get him in the log. After lunch it was wall-to-wall Ukrainians. 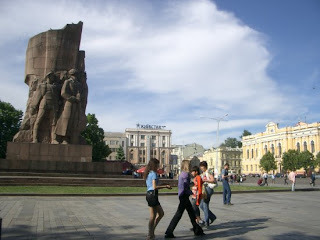 Amongst others I worked Vladimir UR4LME from my wife's home city of Kharkiv where I lived for several months. It's an attractive city if looking a bit neglected, with an abundance of beautiful girls. Although I tried to strike up a conversation Vladimir stuck to his macros. English-speaking hams who disparage the use of macros in PSK31 often forget that many people don't speak English. For them, using macros and sticking to a set format is the only way to make a contact. The number of Ukrainians I met who could speak English was definitely a minority. I should probably set up some macros in Russian, but then I would need Olga to translate the replies I got! After 1600z many stations were heard from the eastern USA, though none were very strong. I managed to work Tom VA3TVW and Jim N4ST. I wonder how long before 10 metres comes alive? Whilst many ham radio blogs have commented happily on the effects of an increase in solar activity, true to form the BBC has managed to find a downside. A story has just appeared on the BBC website telling us that the increase in sunspots will make our sat-navs go haywire leading presumably to airliners crashing, lorries falling off bridges and walkers getting lost in the mountains. There was news story a few months ago (yes, this was actually on the national BBC TV evening news) that the Earth could collide with Mars in a billion years time. Don't let the fact that we won't merely be dead but extinct when it happens spoil a good doomsday story. I sometimes wonder if the BBC is the reason Britain is becoming a nation of binge drinkers on antidepressants. My memory is not what it was, but I seem to recall that people did use GPS during the last solar maximum and nothing catastrophic happened. If you actually read the story, the effect of this increased solar activity is that your reported position could be inaccurate by up to ten metres. Occasionally. Gosh, better start preparing for this now, then. A far bigger problem with satellite navigation systems is that the maps are inaccurate with the result locally that vehicles are still being directed along routes that would take them over bridges that are closed or even washed away after last year's flooding. Now that really is a news story. I just came up to the shack after watching a film to see what was happening on 80m PSK31 and saw 5E50SA in the PSK Browser calling CQ. I had to click on the entry to find out where he was - Morocco! A quick call and he was in the log. 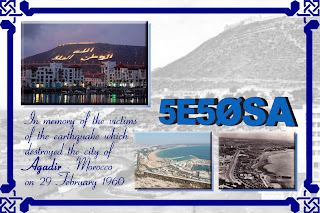 This is a special event in memory of the victims of the Agadir earthquake in 1960. According to QRZ.com the station will be in operation until the end of February so there should be plenty of time to work them. QSL via EA7FTR. Don't worry. I'm not going to start writing about chasing DX with 1KW, or even about gardening! If you read the posts about my new computer, you'll know that I chose one that came with Windows XP rather than Vista or Windows 7 because I didn't want to sacrifice compatibility with unsupported but useful applications and hardware just to get some pointless user interface changes and a lot of bloatware. However I have been using Windows XP for a very long time and felt it was time to look at something different. So I decided to look for some Windows XP themes to give the old but reliable OS a makeover. I soon found what I wanted at Studio7Designs Windows Themes website. There are several attractive themes there which you can download and install at no cost. I rather liked the Studio 28 design. But installing it wasn't exactly straightforward. First, you have to "download and install a UXTheme patcher." And they say we radio hams like jargon! I clicked on the conveniently provided Download button and it took me, not to a patching program but to a download page of ready to use patched files. I had to look in C:\Windows\System32, find out the version of my uxtheme.dll file by opening its properties, and then download the matching one from this page. For some reason the patched files are compressed using the rather odd "rar" archiving format. If you need to know what to do with that here's some information on how to open a rar file. To be honest I was a bit concerned about replacing a system file with one from a third party site, however it checked out clean at virustotal.com where someone had obviously had the same thought as me and checked it previously. Windows didn't seem to want to accept it though. Each time I renamed the existing file and copied the new one into its place, it appeared to get changed back to the old one. In the end I used a crude but effective utility called Replacer which seemed to do the trick permanently. After that it was a simple matter of downloading the theme of my choice, unzipping it to C:\Windows\Resources\Themes (the themes are in the standard zip format) and then selecting it using the Desktop Properties dialog. The result is quite refreshing. The screenshot above is of my program KComm using the new theme. Now all I need to find is a nice desktop wallpaper. I'd quite like something based on a PCB layout, perhaps a high-res picture of a K3 RF board. But I don't really feel like disassembling my K3 just to take a picture! 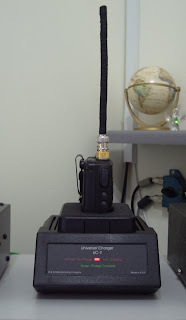 If you read any of the text books on setting up an amateur radio station they always tell you that you should connect everything to a good RF ground. What none of them tell you is how you get a good RF ground if your shack isn't located on the ground floor of the building. I have always tried to use co-ax fed antennas that are properly matched so that there is no RF on the shield of the cable to cause any problems. But in a nod to the text books I have always grounded everything to the copper pipes of the central heating system, which is the nearest thing to ground available in the G4ILO shack. Today I noticed that 15m was open and there was quite a bit of activity on PSK31. I put out a call and was alarmed to find that my PSK IMD Meter was showing an IMD of around -22dB. Jan, UT5CO replied to my call, so I completed the contact and then investigated. The problem was only bad on 15m, and only when using the magnetic loop antenna. On a whim, I disconnected the ground wire from the K3 and the IMD immediately went down. Not all the way to -34dB which I got using the dipole, but around -32dB. I did some checks and there did not appear to be any ill effects on other bands. So the ground wire has been permanently removed. 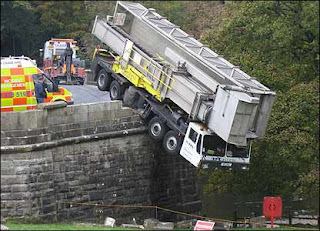 Needless to say, by the time I had got this sorted out, 15m had closed! I recently sold my Yaesu VX-8E because the lack of APRS RF infrastructure in this part of the world rendered that part of its functionality fairly useless and I didn't need two FM hand-helds. My Kenwood TH-F7E is a more useful radio to me because of its ability to receive CW and SSB. The only thing I didn't like about the Kenwood was the lack of a drop-in charger base. To charge the radio you have to uncover a charging socket and then plug in a lead from a wall-wart charger. That might seem like a small inconvenience, but having to crawl around on the floor plugging in the charger, then thread the charging cable through to a safe place to stand the radio while it charged was a bit of a chore. Most hand-helds offer a base charger as an option; even the cheap and nasty Chinese Jingtong had one. I think Kenwood missed an opportunity to sell an accessory here. I was sure I wasn't the only one lamenting the lack of a base charger for this fine little radio so I posted a question about it on QRZ.com and was pointed by Mel KS2G in the direction of W & W Manufacturing Company of Hicksville NY, who make a range of replacement batteries and chargers for two-way radios and other devices. They offer battery packs for most amateur radios, including the Kenwood TH-F6A which is the US version of the TH-F7E and all of them are charged using a drop-in charger. The company didn't respond to attempts to contact it via the contact form on its website, but Mel very kindly phoned and obtained an email address for a helpful lady named Flossie, with whom I placed my order. It wasn't exactly cheap. Since the stock Kenwood battery doesn't have contacts for base charging I had to purchase a replacement battery as well as the charger unit. By the time I paid VAT and tax collection tax it came to half as much as the actual radio. The new battery has a 2000mAH capacity compared to the 1500mAH of the standard version. The charger is a universal unit and takes plug-in "cups" for different radios, so if I ever sold the TH-F7E I could keep the charger and just buy a "cup" for whatever replaces it. I was a bit disappointed to discover that when placed in the charger the radio faces to the side rather than the front. It doesn't really matter, since you can't use the radio while it is in the charger, and perhaps they do that to discourage the temptation to switch it on. But it would look better if it faced the front. Also supplied with the charger was a European 220V switched mode 24V 1A power adapter. I really didn't need that, and would have liked the option to save some cost by not having it. I haven't checked to see if it makes any of the usual switched mode warbly noises and broadband hash. I generally avoid switched mode power supplies at all cost. For batteries up to 7.2V which the TH-F7E is, the instruction sheet states that the charger will run from 15V so I am actually running it from my Diamond shack supply that powers my K3, which normally runs at about 14.2V. It worked fine, and charged the new battery in a couple of hours. I am very pleased with this smart if rather expensive accessory, which will help me make the most of the TH-F7E by keeping it nicely charged up. I have been a subscriber to the Elecraft email reflector almost continuously since 1999 when I ordered my K2, and for most of that time have found it useful. But over the last few weeks I have come to the conclusion that the best thing the company could to do would be to close it. The reflector has been a good forum for communication between Elecraft and its customers. But postings about the K3 have swamped postings about other Elecraft products, making it a frustrating forum for kit constructors. Now that the K3 has reached maturity there are very few useful suggestions for improvements to be made about it. Instead, most postings now seem to be nit-picking complaints, which often result in ill-tempered responses from others who feel there is nothing to complain about, which generate further ill-tempered replies suggesting that some people don't use their radios and don't even understand the problem. The overall impression conveyed to any would-be K3 purchaser who subscribes to the reflector is that the K3 is a very flawed radio with some serious problems. That isn't how I see it. The K3 isn't a perfect radio but I don't think there is anything better around at the moment. The obvious thing to do would be to unsubscribe. Except for the fact that the reflector is the only way to keep up to date with news from Elecraft. If you want to know about new firmware releases and what's in them, or know when new products like the P3 panadapter are ready to be released, the only way to get that information is to subscribe to the reflector. I have repeatedly suggested that Elecraft should create an "elecraft-announce" mailing list that contains only news from the company, and they have equally repeatedly ignored my suggestion. Because the Elecraft reflector is an email list, every subscriber receives a copy of every posting, including every complaint, whinge, gripe and fanboy denial of the criticisms. This tempts everyone to have their say in topics regardless of whether their contribution is useful. Even if you resist the temptation to comment, reading of these "issues" sows seeds of doubt that perhaps there really is something wrong with the radio after all. It was a beautiful morning, the sun was shining from a cloudless blue sky and it felt warm, although the temperature was just above freezing. 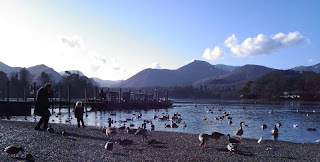 Olga and I decided to go to Keswick, which is one of my favourite places in the entire world, and where I'd live if property prices weren't astronomical. Though being a conservation area in a national park and surrounded by mountains it is probably one of the worst locations for ham radio imaginable. I thought we would go for a stroll through the town and have a coffee and a look in the shops, which we did, but I also spent rather a lot of time standing around being bored while Olga looked at clothes. I loathe shopping, and would buy everything possible - including groceries - online if I could. If I decide I need something I generally purchase the first thing I see that will do the job. Olga has to examine every possible candidate and then agonizes over the decision for hours. Consequently we rarely buy anything for the house requiring a joint decision as I have usually lost interest in buying anything after my first couple of suggestions have been rejected. In Keswick we saw very little evidence of any damage caused by the November floods - unlike the devastation that occurred in our home town Cockermouth. We walked down to the lake, where I took this picture using my phone, since I wasn't carrying the camera. The ducks and geese are very tame and you can walk right up to them. I'm sure they would take food from your hand if you had any. For months I've been saying that I was going to try building a Pixie II transceiver but I never got around to it. Then Roger G3XBM started writing about an even simpler transceiver that he was experimenting with called the XBM80-2. 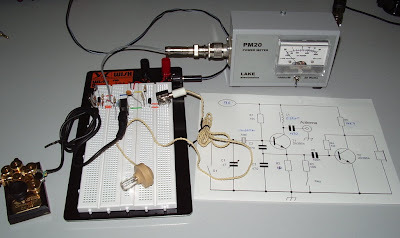 It is a crystal controlled QRP transceiver for 80m that uses just two transistors and a handful of other parts. It looked so easy to build that I couldn't resist trying to make one. I recently purchased a breadboard to use for experimenting with different circuits so I made up Roger's circuit using it. I didn't have any 80m QRP frequency crystals but I did have some for 40m, 30m and 20m. Roger had commented that the design should work on other bands and indeed it does. However on 20m the transmitter chirps rather badly. It was much more stable on 40m where I measured 100mW output, and it would probably be better still on 80m, the frequency Roger designed it for. Reducing the value of L1 helps on the higher frequencies. With a smaller inductance it is possible to see 200mW or more output. However as well as chirp I observed the frequency starting to drift which suggested that perhaps I was running too much power and warming the crystal. The power may be increased or decreased by reducing or increasing the value of R3, which is in series with the key line. With the transmitter on 40m I noticed the second harmonic on 20m was also very loud. Anything is very loud when you are very close to it and I don't have a spectrum analyzer to measure how the harmonic compares to the main signal, but if I was going to use this little radio into my multiband dipole a low pass filter made for the band in use would be a very good idea. The main problem with the receiver is that there is almost no audio output below 2KHz. All of the signals I heard were very high pitched. I tuned across the receiver passband while transmitting a carrier and the signal which was clearly audible a few kHz away disappeared at around 2Khz and only reappeared after I tuned through zero-beat and reached 2kHz away on the other side. So I'm not going to hear anyone who called me. This isn't simply the frequency response of the crystal earpiece because I plugged in an external amplifier and it was just the same. Roger doesn't mention this issue so I wonder if there is something wrong. However it is such a simple circuit that I can't see what to change that would affect this. I tried increasing the coupling capacitor to the audio amplifier stage and it made no difference at all. With such a simple receiver circuit one should not expect miracles. Nevertheless I did (just!) detect a 1uV signal from my signal generator - though only when it was tuned far enough away from the crystal frequency to make a high pitched tone. If I could solve this problem of not being able to receive signals close to the crystal frequency then this would make an amazing little radio. Although I don't use Linux on my shack computer - mainly because Windows has all the best apps - Olga and I both use it on the computers we use for business, both for its stability and its freedom from malware hassles. However, the version we were using (Xandros Desktop) was very old and does not appear to be receiving any updates. This was causing us a few problems, mainly due to being stuck on Firefox 2.0 with similarly outdated versions of Flash. So it was time for an update. Installation was pretty straightforward, if still not quite as trouble-free as installing Windows usually is. On Olga's laptop a bit of jiggery pokery was required to get the wireless network drivers installed. And on mine the "live" installation CD had to be run in compatibility mode which presumably resulted in a VESA display driver being used, restricting the screen size to 800 x 600. Fixing that involved deleting one line from an obscure configuration file, a solution I found after some time spent Googling. On Windows it could have been done through the graphical interface. Having got the new version up and running, I find that I can't store files, or at least see them, on the desktop. 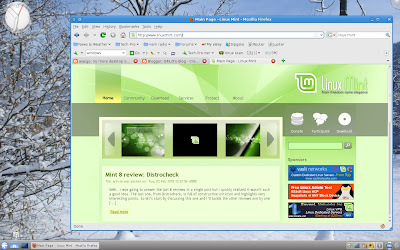 Because Xandros Linux was based on KDE, I chose the KDE community edition of Linux Mint which I thought would involve fewer changes than the standard version which like Ubuntu uses the Gnome graphical environment. KDE has now reached version 4.1 and apparently one of the "features" of this version is that you can no longer have icons on the desktop. I started searching for a way to enable desktop icons and came across this post, apparently from the Linux hacker who removed the support. You can still put files and icons on the desktop, but you can only see them using a little pop-up folder view applet. Because someone has a bee in his bonnet about desktop icons, they get removed - tough if you don't like it. I often gripe about Microsoft changing things in new versions of Windows for no good reason. Clearly Linux is no different. G4ILO's Blog is now at its new home http://blog.g4ilo.com and I'm hoping that nothing got left behind in the move! The actual change from FTP hosting to Blogger hosting was fairly easy. It was just a matter of selecting the "custom domain" option from the publishing options, then clicking the Advanced button and putting in the name I wanted: blog.g4ilo.com. I also had to specify something called a "Missing Files Redirect" which tells the Blogger server where to look for any files used in the blog that it doesn't have. This is important because although the text content is now served up by Blogger (and presumably any images included in new postings will be hosted there) all the images in my existing postings remain where I uploaded them, on the old server. And I certainly did not want to go through over 300 postings editing all the image locations to provide their full path! Next I had to go to my web host and create a CNAME record for the new domain blog.g4ilo.com which pointed to ghs.google.com. This basically tells the world via the Domain Name Service (DNS) that blog.g4ilo.com is hosted on Google's server. I then had to wait while this information propagated around the Internet, so I went and helped Olga get the shopping. That was the easy part. The difficult bit - the part I was concerned about - was ensuring that all references to my blog at its old location would automatically redirect to the new one. Google was promising to build a migration tool that would take care of all this, but I was afraid that it would only take care of the situation where people only had a blog on their server. My blog was cohabiting with my G4ILO's Shack website so I wanted only links to the blog pages to be redirected. Blogger techs told me "you can write an .htaccess file that can do this" but they seemed to have rather more faith in my ability to do this than I had. The .htaccess file is a configuration file used by Apache web servers that allow them to do more than simply serve the page "blah.html" when someone's browser requests that exact page. None of the .html pages at G4ILO's Shack exist as real files at all. They are all generated on the fly from a MySQL database by a content management system which knows what text is required thanks to an .htaccess file that the CMS authors thankfully provided. And I didn't want to break that. The .htaccess file uses something called "regular expressions" to match against the filenames that are requested. They caused a perplexed expression to appear on my face because I don't have the kind of mind that is good at puzzles and I just couldn't figure out how to use them. So I did what I normally do when I hit a technical problem: Google to see if someone cleverer than me had had the same problem and managed to solve it. These take care of, respectively, my old blog main page (blog.html), the RSS and Atom feeds, the archives, the individual posts, and the labels. The thing that caused the most head scratching in the end was the bit of code that displays the last ten blog topics on the front page of G4ILO's Shack. This is generated from the RSS XML file produced by Blogger but for some reason it worked with the copy that was stored on my server but not with the one obtained direct from Blogger even though they looked practically identical. But after more trial and error that issue was also resolved at around midnight last night. I'm crossing my fingers, but I think it all works. I have deleted all the blog files off the old server now, apart from the uploaded images of course and a few other files used by the template. Please let me know if you notice anything that seems wrong. My blog address is now blog.g4ilo.com and you should update it if you are not receiving updates. But because of the redirection, hopefully you won't need to. Now I'm going for a lie down. Somebody please pass me an ice pack! As I wrote in my last post a couple of days ago, Blogger is terminating its FTP service that allowed me to publish my blog on my g4ilo.com server. This will therefore be the last post to this server. I am hoping to be able to migrate the blog to a new location which will be blog.g4ilo.com. It is frustrating to sit and wait for Blogger to come up with a migration tool that may or may not work, because I have several interesting things that I want to write about that I don't wish to be prematurely consigned to the bit bucket. So I am going to attempt to move the blog myself. Don't be surprised if things go a bit haywire in the process. If the address you see in your browser address bar is blog.g4ilo.com (instead of www.g4ilo.com) you will know that the move has at least partially worked. The hard part is going to be ensuring that links to pages using the old address are redirected seamlessly to the new one. This is supposed to be achievable using something called .htaccess, but it is rocket science and I will probably need help with it from Blogger techs or other clever people. So fingers crossed, here we go. The latest casualty of my new computer is that I am no longer able to use my Griffin PowerMate. It's a rather nice black anodized aluminium knob with a glowing blue base which can be configured to control various applications. I had written a program called KTune which allowed me to tune my Elecraft K3 using this knob beside the keyboard instead of reaching over to the radio, and I found it really convenient. So I am disappointed that it no longer works. When I installed the PowerMate for the first time I got a message from Windows that "there was an error with your hardware" but the base started its pulsating thing and I assumed it was just an initialization glitch. However, the knob itself didn't have any effect. I rebooted the system and it froze at the boot menu screen. I switched off the power and tried again - same thing. And I got that sick feeling you get when you think that four days of work has gone down the pan because you have somehow managed to trash the hard disk. Then I had the idea of unplugging what I'd plugged in since the previous boot, which was the PowerMate, and lo and behold the system started up. Phew! But obviously my PowerMate is incompatible with my HP computer. As the system froze before even Windows had started loading it isn't something that can be fixed with an updated driver - it's obviously the hardware itself that my PC doesn't like. Did I mention that I don't like computers? Obviously they don't like me either! On the plus side the new system is much faster, which makes a big difference when running computing-intensive tasks. When running JT65-HF, the old computer took so long to decode any calling stations that by the time I saw that someone was calling CQ I'd missed the time-slot for calling them back. Now everything is decoded in a couple of seconds. There's no gain without pain, as somebody once said. My hassles with getting the new shack PC set up and working continue. I lost the configurations for KComm and Fldigi, including all my macro files carefully honed over several years, because I forgot to save them from the old computer. And the eBay seller from whom I ordered a PCI Express sound card yesterday so that I could get going on digimodes again sent an old-fashioned PCI version just like the one I already have. His response to my complaint is "We have sold many of these and you are the first customer to have a complaint" which makes me feel like the mistake was my fault. I really am thoroughly fed up and wish now that I had just struggled along with the old, slow computer. However it has not all been bad news. At the weekend whilst investigating all the available options I stumbled across this USB Sound Adapter from Digital Daffodil. At a price of £2.49 it seemed worth a gamble, though the post and packing at £3.45 more than doubled the final cost. This also arrived today. I plugged it in and it "just worked" - Windows didn't even ask to install any drivers. I then hooked it up to the K3 and immediately began decoding digital signals. The input is only for a microphone, not a line input, so it is very sensitive. This means I have to run the K3 line output at a very low level - 2 or even 1 - which should avoid the problem of distortion harmonics that I have observed at higher settings. My IMD Meter shows that the transmitted PSK31 IMD is as low as it was when using the old computer and a "real" sound card. In fact, I inadvertently tested at 100W PEP output and the IMD was -28dB which is still pretty acceptable (I normally get -34dB at 25W PEP out on 20 metres.) So despite my initial belief that something this cheap couldn't possibly be any use I'm forced to conclude that it is actually perfectly acceptable. I don't know what the maximum sample rate of this device is. I doubt that it is high enough to use for SDR decoding such as my project to use a SoftRock as a K3 panadapter, so I suppose I do still need a PCI Express sound card. But I'm not in a position to use it at the moment so the idea of returning the card I was sent and asking for a refund is quite tempting. I'm not really cut out to be an award chaser. You can too easily end up with the tail wagging the dog, staying in the shack on a fine, sunny day just to be near the radio because you know that someone is going to be activating a rare island or whatever. 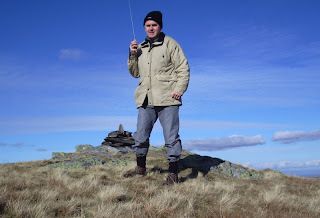 This weekend I had hoped to catch some activations of Wainwright summits for SOTA and WOTA. But I had to go out. The activator was using 2m SSB, and an FT-817 was too bulky and conspicuous to carry around with me. So I took to wondering, not for the first time, what a shame it is that the Kenwood TH-F7E (TH-F6A to you Americans) cannot transmit SSB as well as receive it. Back in the 1980s when, despite the lack of sophistication compared to today's technology, ham radios somehow seemed more exciting and innovative, you could buy radios from small manufacturers like Mizuho, Belcom and Shimizu that offered something out of the ordinary compared to the offerings from Yaesu, Icom and Kenwood. One such product was the Belcom LS-202E, a 2m hand-held transceiver that worked on both FM and SSB. It was slightly larger than a 2m FM hand-held of the time, with 1.5W output (fairly standard for those days.) The frequency was selectable using thumbwheel encoders as in Icom's highly popular FM hand-held, the IC-2E. I had one of these radios and had quite a lot of fun with it. I was also trying to break into journalism at that time so I wrote a review of it which was published in the short-lived independent ham radio magazine "Amateur Radio". If you are interested, you can see a copy of the review. Sadly, the LS-202e wasn't a keeper. The output on SSB was quite low and there appeared to be no speech compression or ALC so you couldn't make the best of that 1.5W. Stations who found you weak on SSB often heard you better when you switched to FM. Another problem - which I didn't discover until after I'd written the review, so it wasn't mentioned - was that the synthesizer tended to go out of lock if the radio was cold. And it usually is cold out of doors in this country, so several trips out to work SSB from the hilltops proved abortive. The radio went back to the importers two or three times to try to make it work right. But they never really succeeded, so in the end I sold it. I still think the basic concept was a great idea. And I'm surprised that none of the radio manufacturers have tried again to make something like this using today's much improved technology. A multimode hand-held you could slip in a pocket covering VHF and even HF with a couple of watts output would have me plunking down my money faster than you can say "Mastercard." How about it Yaecomwood? Before disconnecting my old computer, after wiping the hard drive, I installed Ubuntu Linux on it from a DVD I had lying around. When the desktop came up I was amazed how clear and sharp the print was, compared to Windows. When I got my new computer, running Windows XP, the print at first looked horrible. By default the fonts were unaliased, the edges not smoothed, a reminder of computers in the 1990s. I soon found and enabled the ClearType option to smooth the edges of fonts, but the result made me think there was something wrong with my spectacles - not so much ClearType as BlurredType. After a couple of days I got to wondering whether there was some alternative to ClearType that would smooth the edges of fonts but look sharper. After all, if Linux can do it surely it is not beyond the abilities of Microsoft? And I eventually stumbled across the ClearType Tuner, one of Microsoft's PowerToys for Windows XP. The ClearType Tuner is easy to use. Just install it, run it, and then click to select the font samples that look best on your screen. It has made a world of difference. If you think the print on your screen could be sharper, you should give it a try. What I don't understand is why, in an operating system you have to pay for quite handsomely, this essential feature is only offered as an unsupported and unpublicized option.